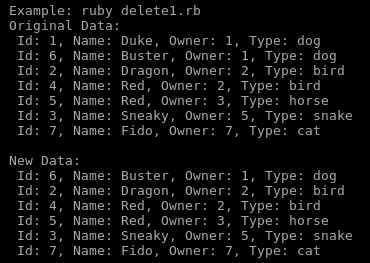 We use the ruby-oci8 driver to delete some data in the database tables, using the connection object created in the Initial Setup section of the first post in this series. 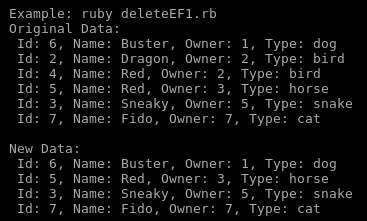 First, let’s run reset_data.rb to set up our data. 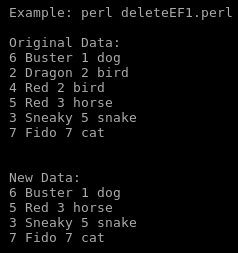 statement = "delete from lcs_pets where id = :id"
statement = "delete from lcs_pets where type = :type"
statement = "delete from lcs_people where id = :id"
statement = "update lcs_pets set owner = :newOwner where owner = :oldOwner"
statement = "delete from lcs_pets where owner = :owner"
In this post, we’re going to take a look at the U in CRUD: Update. 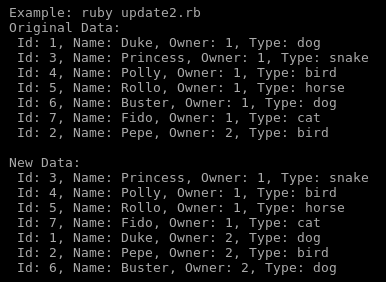 We use the ruby-oci8 driver to update some data in the database tables, using the connection object created in the Initial Setup section of the first post in this series. 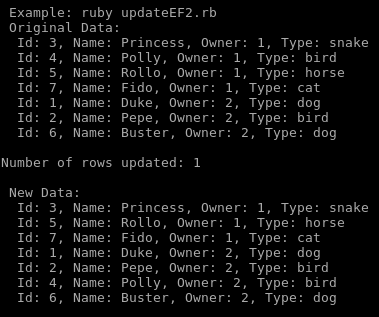 My helper function get_all_rows() encapsulates a select statement used to verify that the updates worked. 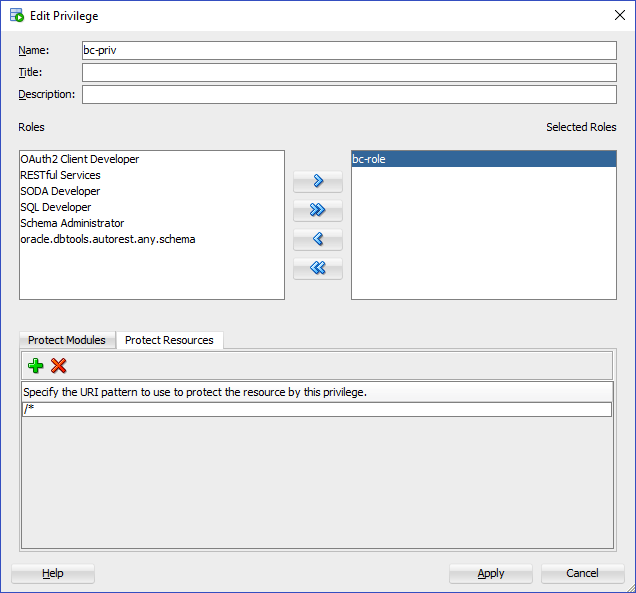 The select functionality is covered in the R part of this series, so I won’t go into the details here. We will perform a simple update that modifies a single record in the lcs_people table. These are the steps performed in the code snippet below. 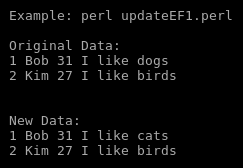 Prepare a SQL UPDATE statement, changing age to 31 for the record with an id of 1.
statement = "update lcs_people set age = :age where id = :id"
Update Bob’s notes to ‘I like cats’. 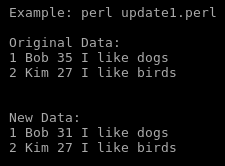 statement = "update lcs_people set notes = :notes where id = :id"
Change the boilerplate get_all_rows statements to get pet data. In the above example, notice that we used the id column in our where clause. For our data set, id is the primary key. 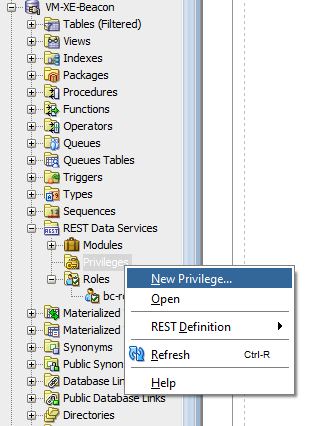 You do not always have to use a primary key, but you should make sure you only update the rows you intend to. Next, let’s look at updating multiple rows. We’ll have Bob give his dog Duke to Kim. 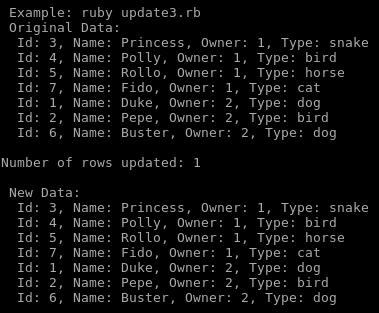 Prepare a SQL UPDATE statement, changing owner to 2 for the record with an owner of 1 and a type of ‘dog’. 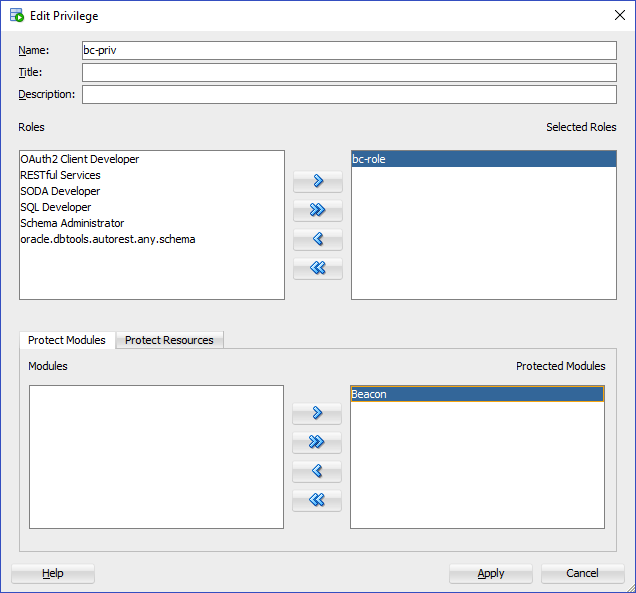 Bind the newOwner, oldOwner and type values. 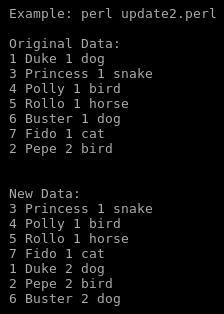 statement = "update lcs_pets set owner = :newOwner where owner = :oldOwner and type = :type"
In our example we only used owner and type, assuming that Bob only had one dog, Duke, as it is in our original data. 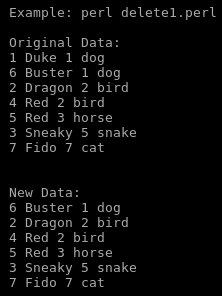 With the new reset data function, we added a second dog, Buster. 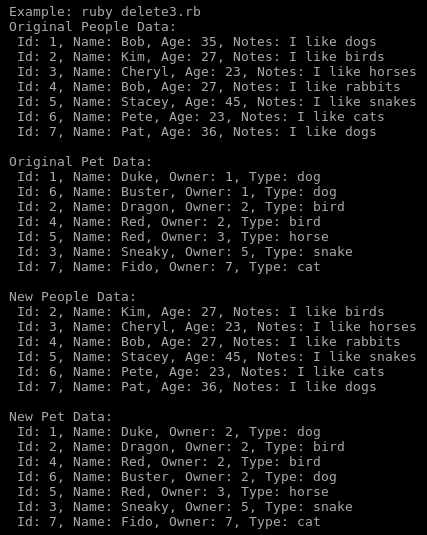 This example is intended to demonstrate what may happen when multiple users are working with the same data set. 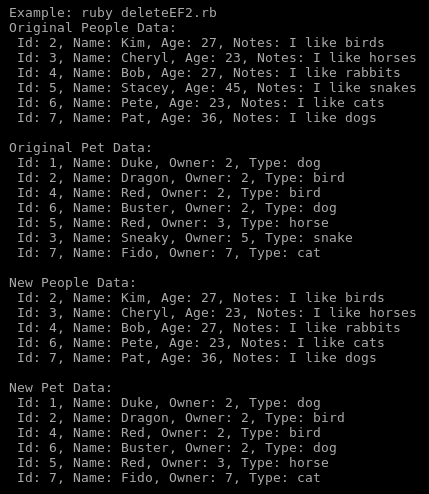 In our data, the only unique identifier for lcs_pets is id. Bob may have two dogs, or even two dogs named Duke. Make sure if you intend to change a specific row you use a unique identifier. Now let’s give Buster back to Bob. 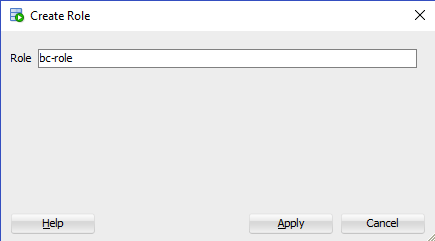 This time we will use the unique id column and we will print out the number of rows affected using the return value from cursor.exe. 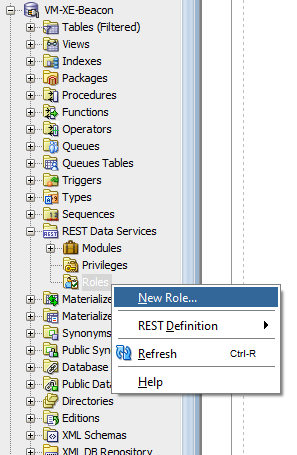 Prepare a SQL UPDATE statement. Bind the newOwner to 1 and id to 6. Execute the statement returning the number of changed rows. Print the number of changed rows. statement = "update lcs_pets set owner = :newOwner where id = :id"
cursor.exe will return the number of rows affected for insert, update and delete statements and for a select statement, it returns the number of the select-list. Give all birds to Kim that she doesn’t already have and print the number of affected rows. 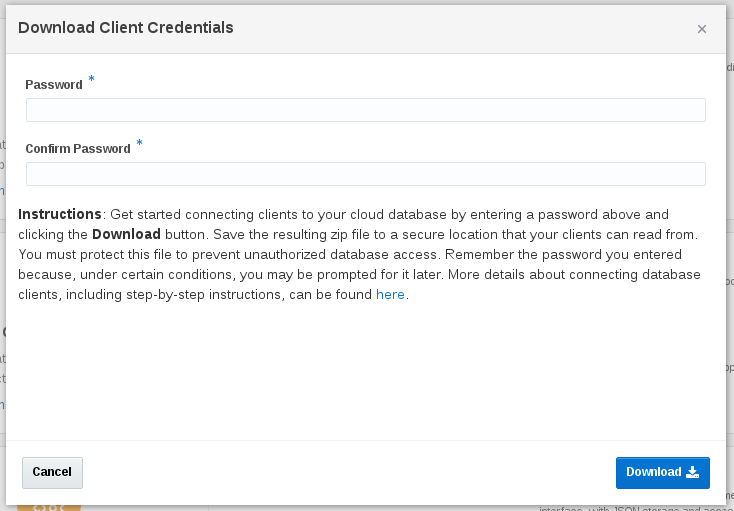 statement = "update lcs_pets set owner = :newOwner where type = :type and owner != :oldOwner"
We use the DBD::Oracle driver to update some data in the database tables, using the connection object created in the Initial Setup section of the first post in this series. Update Bob’s notes to ‘I like cats’ .